Okay...I realize to most people baseball in Colorado has about as much appeal as a tongue depressor. I don't expect very many to know what is going on out here, but trust me...it's worth a look. These guys can flat out play and they are making history while they do. Julie and I were able to attend Monday nights game and witnessed the first ever seven game playoff winning streak to get into the World Series. 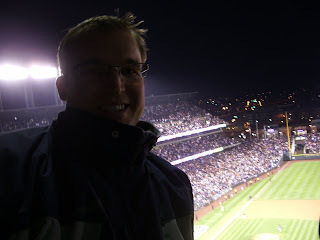 Our seats were a few rows above the mile high mark and the game was played well below it. The 34 degree weather staved off the nose bleeds! We had a great time. We were so poor, we would eat oatmeal for breakfast, drink water for lunch, and "swell up" for dinner. You know, Joann is on that new bananas and coconut diet. She hasn't lost any weight, but you should see her climb trees. I got an injury the other morning. I was splashing some "toilet water" on my face and the lid fell and hit me on the head. If these old family jokes don't make you want to read this blog every morning, nothing will. Stay tuned for more.